LIVONIA, Mich. (Feb. 10, 2006) – One small item that is often overlooked is the shifter in the Ford Mustangs. As long as it works, who cares? Right? Actually, you couldn’t be more wrong. Roush Performance is offering a shifter that not only shortens the throw by 40 percent for a faster gear change, but can also take the retro-mod styling of the Mustang another step forward. Help get the maximum performance out of your 2005-2006 Mustang by replacing the OEM shifter with the Roush Performance version. Quicker shifts and less gear grinding are just a couple of the side benefits of this shifter which was designed by the same engineering group that has helped Jack Roush’s racing teams win two Nextel Cup Championships. 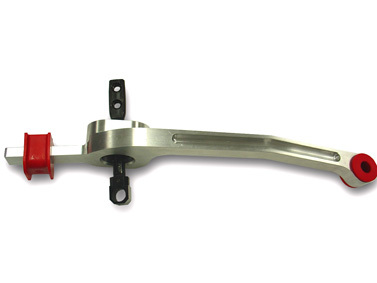 The 2005-2006 Mustang Short Throw Shifter (part number 401376) has a suggested retail price of $285.70. The optional white ball has the classic Muscle Car styling with the shift pattern etched in black and retails for $27.95. Complete the ensemble by adding the $39.95 retro stick shift. Based in Livonia, Mich., “The Art of Performance Engineering” takes place at Roush Performance. In addition to the Stage 1, Stage 2 and Stage 3 Ford Mustang and F-150 styling, handling and performance upgrades, a complete line of performance parts and engines are offered. For more information on the Mustang Short Throw Shifter or any of the other products, visit www.RoushPerformance.com or telephone toll-free (800) 59-ROUSH.